Microsoft Word can be used to load local or remote documents. Remote documents can for instance be hosted on a network drive or removable storage device. Word users who often work with remote documents may have experienced data loss in the past if the connection to the network drive or storage device was lost while working on the document. Microsoft Word offers options to prevent data loss caused by connection issues to remote storage. 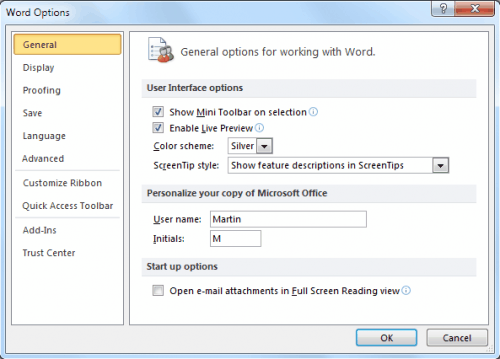 The option is available in Word 2003, 2007 and 2010. This guide explains how to make the configuration changes in Word 2010 so that copies of remote documents are always stored on the local computer system during editing to prevent data loss. The File button in the upper left corner of the Word window opens a context menu that includes a link to the Options menu. The left sidebar links to specific configuration categories like Save, Proofing or Language, the right content area lists the parameters that can be modified in the selected category. The Advanced category displays a large list of parameters that can be changed in Microsoft Word. 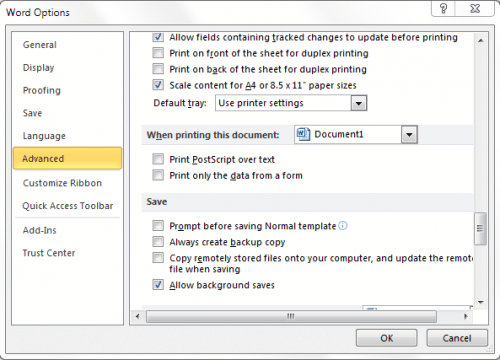 The Save sub-heading under Advanced contains the parameters needed to make the changes to work with local copies of remote Word documents. The entry "Copy remotely stored files onto your computer, and update the remote file when saving" is responsible for this. Enabling it reduces the chance of data loss while working with remote documents in Word. The parameter "always create backup copy" can be enabled to increase the security further. Word will always create a backup document copy once the option has been enabled. One interesting thing is that those backup files are much less prone to be corrupted.